My son was trying to catch a glimpse of the airplanes while we waited to board our flight to Naples, Italy. He stood up in his stroller, which was weighed down by bags and gadgets hanging off the handle. Just like a see-saw, when he lifted his weight off one side of the stroller, the other descended…hard and fast. And my son flipped over along with the stroller. Judgmental mamme and nonne in line with me gave me the stink eye for my ineptness. I turned as red as the stripe on the Italian flag. Traveling from the United States to Italy alone with my then 3-year-old son was like going off on a Middle East peace-keeping mission. I felt like it should be possible, but then I remembered others before me have tried and failed miserably. Some didn't make it back alive. My son wouldn't have been able to commit such acrobatics if we hadn't been waiting so long to board the plane, which was the beginning of my disdain. The airport terminal seemed to have no air conditioning on one of the hottest days of the year, so we were all dripping with sweat. And we had to wait for the Real Housewives of New Jersey and their crew – no joke – to get into "first class," which I put in quotes because it's not like Meridiana, a discount airline based in Sardinia, Italy, has a first class. To say the least, the natives were restless, and this trip wasn't getting off to a good start. Still, shockingly, I'm going to argue that you should give this airline a chance if you're interested in convenience and affordability. First, however, let's deal with the cons because, well, those are usually far more interesting. 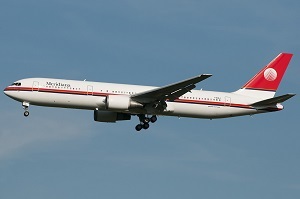 The tagline for Meridiana is, "Questo si chiama volare," which means "This is what you call flying." Certainly, the airline flies you from one destination to another. This is a fact. But if the claim is that it outshines other airlines, then it's sadly mistaken. One of the people in line with me last year lamented that he felt as though he was boarding a third-world, put-put plane. The size is fine. It's not like you're traveling with nine passengers and the pilot takes your luggage (which has happened to me for a domestic flight at least once and is never a good sign, but I digress). However, if it's possible, the legroom in economy class on Meridiana seems to be less than any other plane in the history of the world. You might actually feel like a sardine. I mean I don't think it's hyperbole. I have had elderly and ill relatives, who have sworn they will never take the airline again for this very reason. It's worth noting that you can pay a little extra to get roomier seats, but it still might not be enough for you. 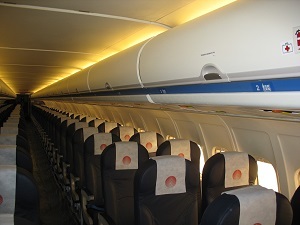 Aside from the claustrophobia you might experience, you will also be appalled at the old-fashioned look of the plane. This isn't retro chic. This is just plain old and outdated. Some of the seats are broken and the arms might not come down or go up. And there is one TV at the front of the seats and sporadically in the aisles. There is no picking the movies you like or playing games for the 9-hour flight to Naples. This might not be a big deal to you because you have your tablets, which you can use without wifi, of course. But when you have a 2-year-old, who is viewing the universal movie with a giant fire-breathing dragon taking down cities and choking people to death, you won't appreciate it. That set off the tears of my son and another child on the plane, and they pretty much made noise for the entire length of the film. When you're not distracted yourself, and you look around at the plane, you will start wondering whether the engine is as old as the 80 year old sitting next to you. Then, you start praying the screws aren't going to come loose on this flight. By now, you've forgotten that this is actually a review in favor of taking these direct flights on Meridiana. So, why should you consider it despite the fact that I'm backing this airline in the way staunch Republicans are backing Donald Trump for president in that they aren't? No other airline offers direct flights to Naples or other southern Italian capitals from New York. This means that you have to take connecting flights, which makes your trip even longer and your jet lag even worse. When you're a mom traveling alone with a little one, you want to get to your destination (in my case, my husband) as quickly as possible. If I leave at around 5 or 6 at night in New York, I will be with my husband by 6 in the morning in Napoli. Mentally, I just can handle that thought better than a layover. My body always thanks me for it. I should point out that I head to Ischia when I go to Italy, which means no matter which plane I take, I will have to take a car and boat ride before reaching home anyway. Cutting out some of that travel is what I imagine winning the lottery feels like. Also, price matters. It is actually cheaper to go direct. For starters, you're paying for one plane less, which means using less gas and amenities. But Meridiana is a discount airline, which means the price is already lower. My son and I actually paid $800 total round-trip for the both of us when we went to Italy and stayed from June to October in 2014. When we go in the summer at the height of tourism season, we pay between $1,000 and $1,500 for the both of us. That's an excellent price. Isn't it great? Now, you can tell yourself to va fa Napoli – and mean it, in a good way. Di Meglio writes the Italian Mamma blog at www.francescadimeglio.com. You can follow the Italian Mamma on Facebook or Twitter @ItalianMamma10.